When taking a Shot is Healthy! When you first think about taking a shot, you may have flashbacks to your college years or you may even cringe just at the thought of it. 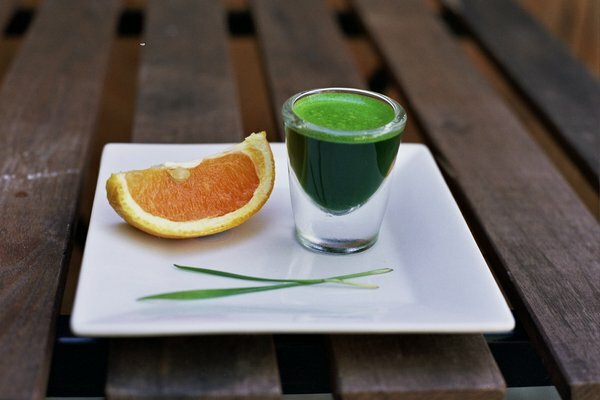 However, the shots that I am talking about are filled with a lovely little hero called wheatgrass. This gloriously potent green machine may still make you cringe at the thought of fresh grass about to be guzzled down your throat; but thankfully, this kind of shot will not leave you feeling like a pile of manure the next day. Instead, you will reap the amazing benefits that wheatgrass has on the body. The benefits of wheatgrass can seem to be never-ending, but to save you some time I found a list with 15 of the most impressive benefits. 1.) It boosts the immune system and nervous system. 2.) It enhances the capillaries and reduces high blood pressure. 3.) It prevents graying of hair and removes dandruff. 4.) It improves digestion and metabolism. 6.) It is an excellent skin cleanser. 7.) It improves blood disorders. 8.) It contains antioxidants which repair damaged cells and rejuvenates aging cells. 9.) It treats acne and pimple problems. It removes acne scars. 10.) It removes weakness and fatigue. It is immediately absorbed in the blood stream & gives instant energy. 11.) It purifies the blood and cleanses the kidneys, liver and urinary tract. 12.) It increases red blood cell count. 13.) It is an appetite suppressant. 14.) It is suitable for diabetics, as it regulates blood sugar levels. Out of all 15 benefits, there are four that I can personally attest to. When I was taking wheatgrass shots more regularly in Austin, TX, I only became sick one time in an entire year. I also notice a significant difference in the health of my skin when I am drinking wheatgrass on a regular basis. I have struggled with moderate to severe acne since I was 15, so I am always looking for a natural solution to my skin woes. However, I would have to say the benefit that you will notice the fastest, is the instant energy boost you will receive from the shot. The absorption process happens so quickly because it goes right to your blood stream. You will literally feel like you are getting “life juice” pumped into your body. It is amazing! The buzz around wheatgrass juice is also being fueled by studies conducted by doctors around the world. I found two studies that were quite impressive. The first study sought to find out if wheatgrass juice had cancer preventative properties. Dr. Chiu Nan Lai found that when, “using the standard Ames Test, she showed that an extract of wheatgrass, when applied to known chemical mutagens (compounds that cause cells to become cancerous), decreased their cancer causing ability by up to 99 percent.”(2) I find anything that reduces cancer causing ability by 99% to be astounding! The second study looked at if wheatgrass could improve the quality of life in terminally ill cancer patients. The study was conducted from January 2003 – December 2005 on 400 solid organ cancer patients. The age range was 22 – 87 years old and they had several different types of cancers, including lung, breast, esophagus, colon, ovary, liver cancer, and stomach cancer. With all that you have learned in the last 3 minutes you spent reading this post, I bet you are just itching to try a lovely swig of that glorious green energy. If this is going to be your first time throwing back a shot of wheatgrass, I would recommend stopping by your local Jamba Juice. They offer different sized shots, and they will even serve your shot with an orange wedge to chase it. Once you start to notice the amazing benefits of wheatgrass, you may want to invest in an electric or manual juicer. Ben, my husband, and I have been drinking wheatgrass long enough to realize it is something we would like to have as a part of our daily routine, so we are going to invest in a manual wheatgrass juicer. Juicing at home requires much more commitment, because you have to grow the grass, clean up the pulp/mess you will make while juicing, etc. But, it is much more cost-effective and convenient to juice in your own home. I am going to post links to Jamba Juice and a website called WheatGrassKits, that displays several different types of wheatgrass juicers below. In general, a healthy amount of wheatgrass to drink is 1 – 2 ounces a day. If you are just starting out, you may want to start at 1 ounce. Please give wheatgrass a shot…(pun intended) and let me know how you enjoyed it! Also, please comment if you have already tried wheatgrass and love it… or hate it! All this talk about shots has left me with the wonderfully, annoying song, Shots by LMFAO featuring Lil Wayne, stuck in my head… you know what I’m talking about! Maybe this can be your theme song in the morning when taking your wheatgrass shot! Come on everybody! Shots! Shots! Shots! Shots! Shots!